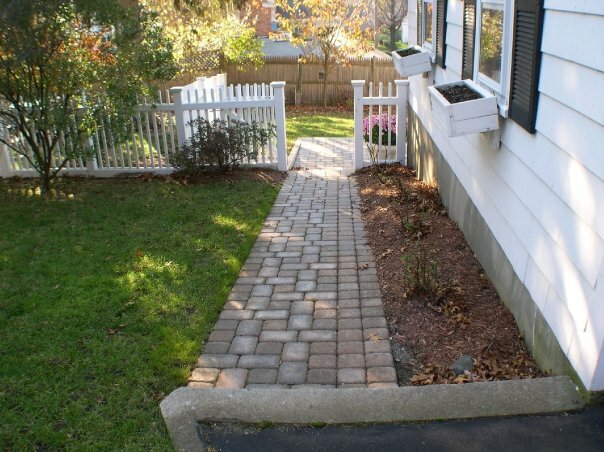 A simple way to make a statement with your Milton, MA, landscape is to keep it in great shape throughout each season. Making smart decisions connected to your property’s functionality and appearance is far easier with the professional landscape and property maintenance services offered by Towne Tree and Landscaping, Inc. The following are basic landscaping services that we offer in order to keep your property flawless. One of the most exciting aspects of our work is turning your outdoor vision into a reality. From the initial concept through to a detailed plan and beyond to the final construction, we work closely with our clients in developing their landscapes to their full potential. As well as constructing and installing additional elements, we can assist you in choosing materials, deciding on color schemes, and selecting laying patterns that most suit the architectural style of your home. Creating and maintaining gorgeous landscapes is our specialty. Our experts will test your soil for planting, decide on the best flower, shrub or tree options for your area, and determine where they’ll thrive the most in your landscape. We welcome questions and offer advice on which types of plants are the right for you based on your landscape’s layout, design theme and personal requirements. 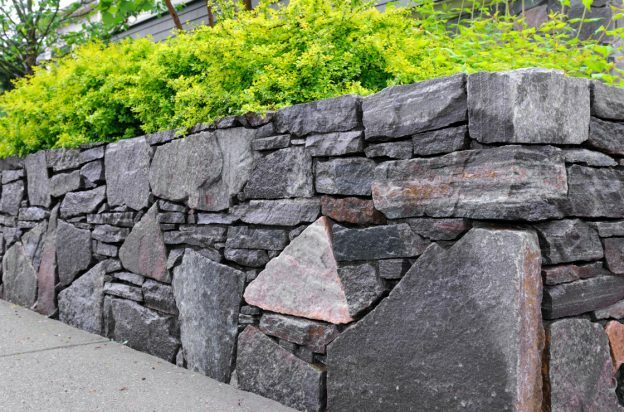 Regular maintenance of your hardscapes and softscapes is what keeps your outdoor space looking immaculate throughout the seasons. Our landscape maintenance service will inspect every corner of your property, repair any damage, and correct any challenges you may be facing before they can become major issues. Maintenance requirements change from season to season. As such our adaptive strategies ensure that your landscape receives the care it needs specific to the time of year. This includes fall cleanups, snow removal, and repairing winter damage in order to take advantage of the spring growth season and ensure a gorgeous summer landscape. Irrigation is a great way to save money and create an eco-friendly, water-wise landscape. Professionally installed irrigation systems use water strategically by targeting the zones that require water and in amounts that are optimal for the specific flora. Taking proper care of a lawn requires regular mowing and maintenance with the right equipment, as well as fertilizer and seeding techniques, to keep it healthy. Our lawn care service is committed to keeping your lawn disease-free and in top shape. Our certified arborists have the level of knowledge and experience to plant, care for, and maintain your trees year in and year out. Pruning or removing trees is dangerous work that should be done only by a trained professional. Regular tree inspection and tree disease treatment and prevention is vital for maintaining an immaculate landscape and will increase the value of your property. Thriving plants add warmth and life to your outdoor space, and keeping them healthy and colorful is a huge part of what we do. Soil testing, fertilization, and general care ensures that your plants add vibrancy and character to your landscape. This entry was posted in Maintenance and tagged Choosing a Landscape Contractor, Irrigation, Landscape Construction, Landscape Design, Landscape Maintenance, Lawn Care, Plantings, Tree Care on November 11, 2017 by 12850420. The best way to create a unique landscape design that reflects your personality is to start with a theme. 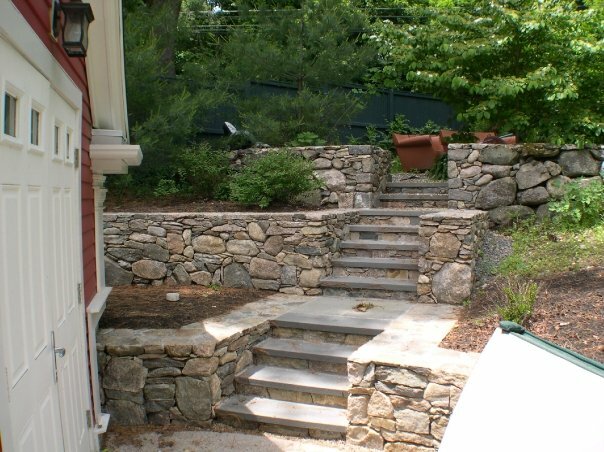 Whatever your style, a theme will allow all the elements of your Hanover, MA, landscape to work together to form a cohesive look. Designing a gorgeous backyard is easy when using one of these four popular landscape themes. 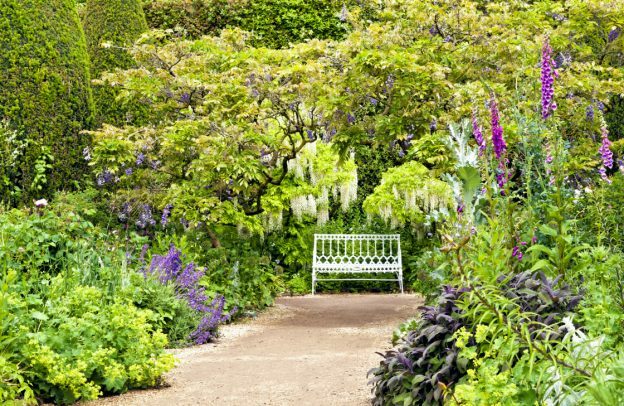 English country gardens combine the structure of a formal garden with the whimsy and charm of cottage wildflowers. Embrace natural curves for a landscape that leaves elements to be discovered. Place benches strategically throughout the yard to provide quiet spots to read or visit with a friend. Strong groupings of plants create the signature look of an English style landscape. Bright roses crowded on a trellis and long flowerbeds with plants arranged by height and color provide unfussy, low-maintenance gardens. Using brick masonry for walls and fences will add a classic feel to your English landscape. If your ideal getaway is a beachside paradise, a tropical theme will turn your backyard into a private retreat. Including a pool as the main feature of your tropical landscape is the perfect way to create a resort-like atmosphere. Natural stone decking and a sloped beach entrance will give your pool a more natural feel. Including a waterfall feature is the perfect way to mimic a tropical swimming hole. Add a hot tub to make your backyard retreat even more luxurious. A poolside bar and cabana will extend your living space and make your backyard a destination for social gatherings. Designing a traditional Japanese garden will create a tranquil and relaxing backyard. Natural materials and harmonious elements are the foundations of a well-designed Zen Garden. A water feature is the perfect focal point for an oriental style landscape. Including a koi pond creates a serene spot for quiet contemplation. Adding seating around the pond will provide a spot to gather with friends and family. To create the same feel in a smaller yard, include a soothing Japanese fountain in place of a pond. Incorporating bamboo fences and large boulders provides the structure of hardscaping elements while maintaining a natural feel. Curved pathways and arched bridges that flow with the landscape will guide guests while complementing the theme. A Japanese garden favors interesting shaped trees and shrubs over flowers. Trees such as Black Pine, Japanese Maple, and cherry will provide a striking silhouette for your oriental-themed yard. A modern landscape features clean lines and functional, low-maintenance elements. The goal is to expand living space with outdoor rooms that serve a purpose and also look striking. 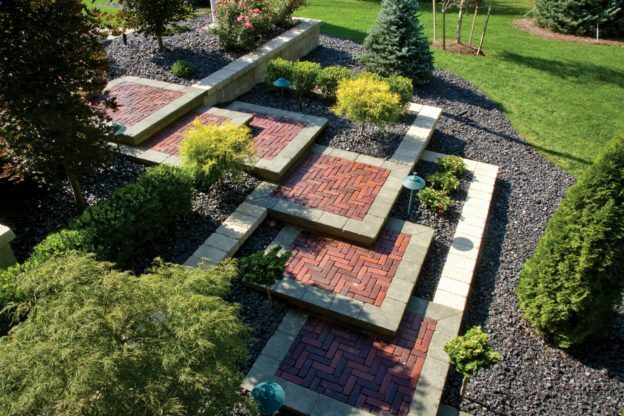 Hardscaping with large format concrete pavers is one of the most versatile ways to build a modern landscape. Permanent seating, raised planters, and geometric patios formed with sleek concrete pavers will give your backyard form while adding useful elements. Including a fire feature creates a stylish and functional focal point for a modern garden. Low fire pits and flat-profile fireplaces provide warmth and extend your outdoor season. Using plants sparsely and keeping them contained is key to a modern landscape. Plant patches of grass between hardscaping elements. Adding plants in containers or defined beds will soften the look. This entry was posted in Design & Construction and tagged Country, Landscape Design, Landscape Design Themes, Modern, Plantings, Tropical on November 1, 2017 by 12850420.